I had the pleasure of going to a fiber arts group meet up last night. It’s a newly resurrected group of local knitters, crocheters, felters and other fiber artists that meets a couple of times a month. Last night’s theme was show and tell, so I brought a slew of FOs to share. It was really nice both to see what other people had made and to get some lovely feedback on the things I shared. I’m hoping I can go regularly in the future! 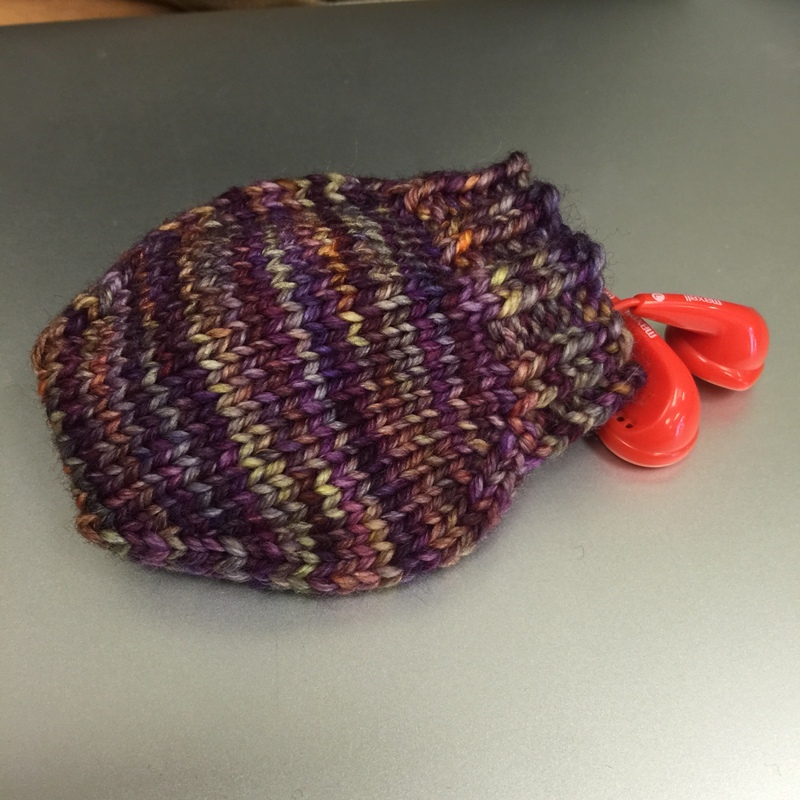 I have a few new things to share, starting with one teeny FO. 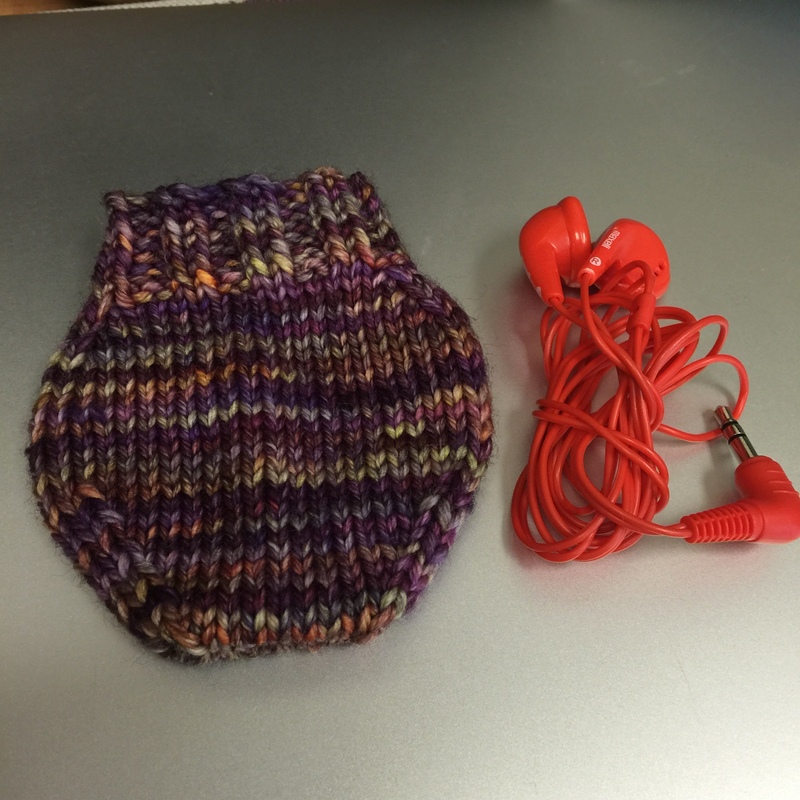 I made an Ear bud pouch to match the River District Toque I made for my SIL. The pattern is free on ravelry and is a great way to use up odds and ends of yarn. I used about 19 yards of malabrigo Rios. 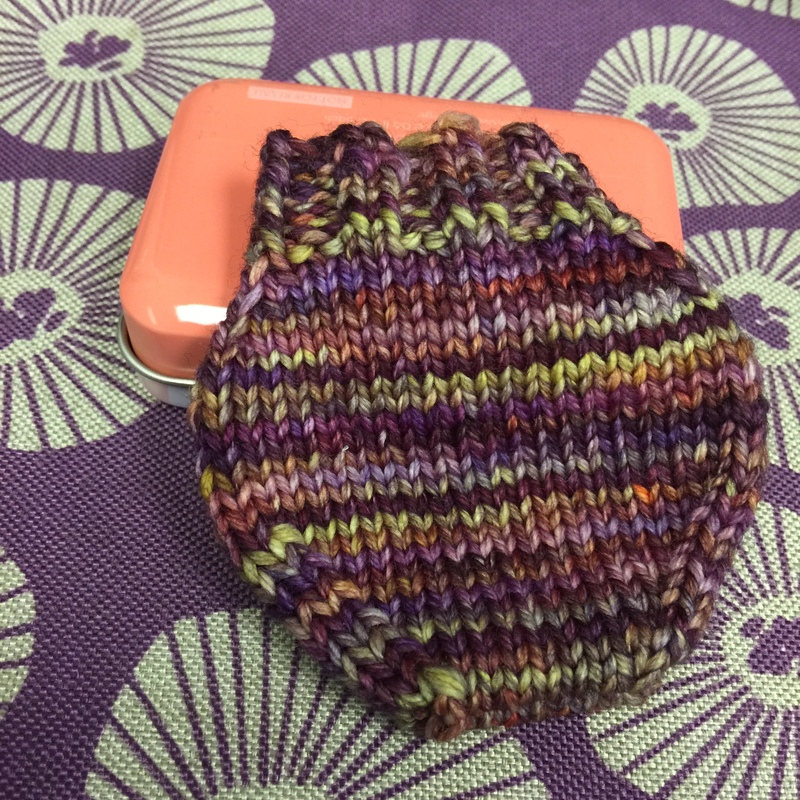 I made a couple of modifications to the pattern, other than using worsted weight yarn. I did one extra decrease row at the bottom and, instead of grafting the bottom edges together with Kitchener stitch, I turned it inside out and did a three needle bind off. It worked really well! If I make this out of worsted weight yarn again, I would cast on fewer stitches and add one increase row to make the neck a little snugger. The increases used in the pattern were new to me. It calls for raised increases (RRI and LRI). See my project notes for explanations. I found them a little tricky at first and couldn’t find much online to help. However, they’re really easy once you get it down. I think this will be a great addition to my SIL’s present! My previous WIPs are coming along well. Lacy Loo is done except for weaving in a couple of ends and blocking it. I had the little try it on and she immediately starting rolling around on the floor, so I couldn’t get a good picture. I’m happy with how it turned out. More on that when it’s blocked and properly photographed! My Color Dipped Hat is also coming along well. I’m so glad I ripped it out and restarted. It looks just right size-wise now. It’s probably close to halfway done. I haven’t been hurrying on it since it doesn’t need to be done until Christmas. I’ve cast on two new projects in the past couple of days. One is done and blocking but I can’t share it yet–it’s a test knit for a pattern that’s not released yet. 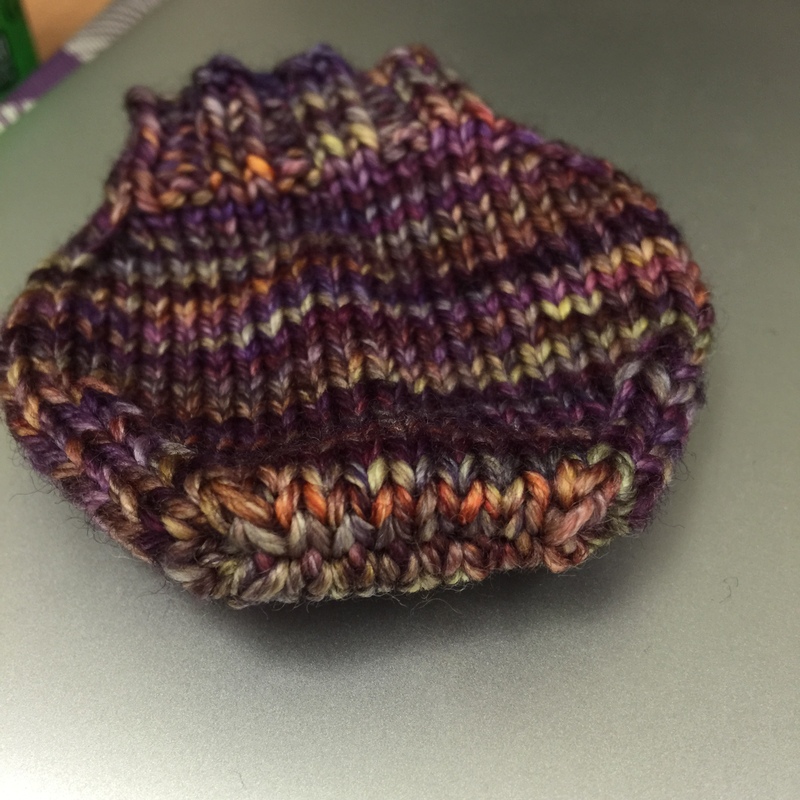 It is a baby hat in super bulky yarn so it went really, really fast. The other is my Pretty Crabby hat for my daughter’s bestie. The pattern is Jumbo Crab Cap from Baby Beasties: Monster mittens, hats & other knits for babies and toddlers, a book the wifey got me from the library. It doesn’t seem to be in ravelry yet. I don’t love the pattern so far so I’m making a lot of modifications. The idea is so cute, though, that I want to make it. Mods so far are doing 2×2 ribbing instead of a rolled stockinette brim and casting on 75% of the called for stitch count, then increasing on the first round after the ribbing. So far I’ve finished the hat portion. It’s washed and is currently blocking/drying. I’m using stash acrylic as I doubt it will get a ton of wear. Also, it was the only yarn I had on hand that was the right weight and color (and it’s a good stash buster). After looking over the directions for the claws, I think I’m going to make some more modifications. The pattern says to make a total of four claw shapes and then sew two together to make each claw. 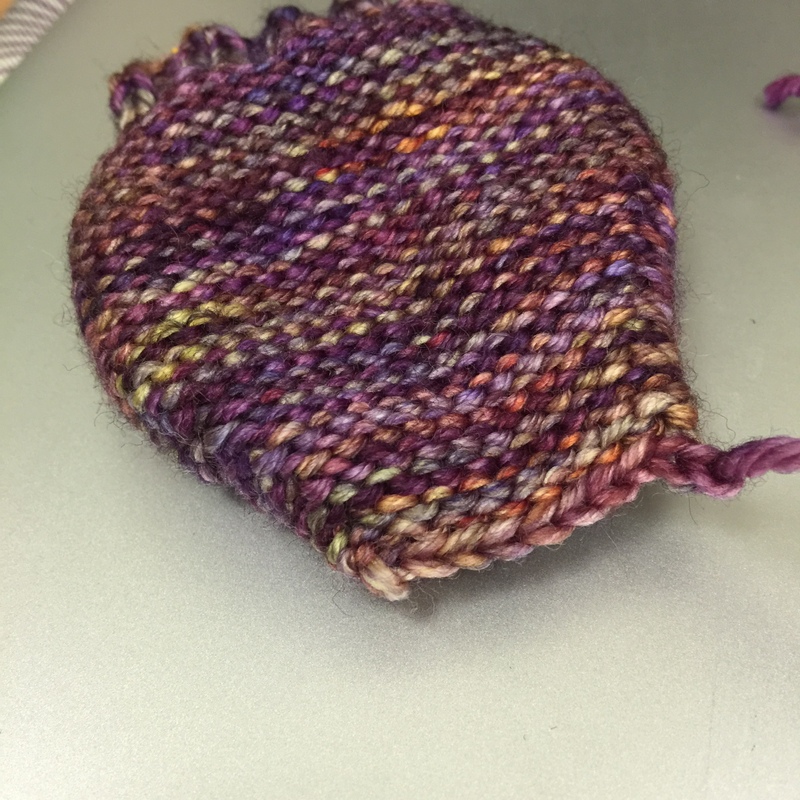 However, the edges are all rough and uneven in the pictures so I’m going to try to figure out a way to knit them in the round instead. Shouldn’t be too hard. The eyes are designed similarly so I’m going to have to figure something out for those, too. I have lots of projects in the planning stages. I want to make a car blanket for my FIL for Christmas. I’m going to base it loosely on this pattern, but instead of knitting it in one contiguous piece, I want to do garter squares in alternating directions a la Mason Dixon Knitting. I’m planning on using up as much of my Caron Simply Soft as I can on it. I have black, black tweed and a dark red. I’m going to throw some other random grey acrylic in there too so it will have Ohio colors. I need to start swatching so I have an idea of how to divvy up the colors based on the yardage I have. Another project that’s percolating is a chevron blanket using two different shades of an acrylic/wool blend I have in my stash. I have enough yardage to make a decent size blanket, I think. Not sure what it will be for, but it’ll be useful to someone at some point. It might actually end up being a car blanket for me. At some point, I will start working on a Feathery Lace Stole for my mom using the purple Rowan Kidsilk Haze I scored at Goodwill a while ago. The wifey requested a Drachenfels so we’re in the process of selecting yarn for that. I’ll make another shawl for my MIL, but I don’t know what pattern or yarn that one will be. Also, I have a couple more Christmas presents to figure out, but they shouldn’t be anything that’s too huge or time consuming. Last, but not least, I was lucky enough to win another pattern from the weekly chat giveaway on Melanie Berg’s ravelry group. This time, I chose The Miller’s Daughter. It’s a shawl knit in three colors of lace weight yarn. I have tentatively selected yarns, and I’m super excited about it. I am planning on using The Fibre Company Road to China Lace in Sapphire and Cherry Tree Hill Superlace Ragg in Ocean for the main colors and madelinetosh tosh lace in Edison Bulb for the accent color. I think it’s going to look AWESOME. I don’t know that I’ll get to it while it’s still cold enough to wear it, but I’ll try! I have my work cut out for me! Boo, Ohio. Sorry, I’m obligated to do that since I’m from Michigan. But the FO looks great 🙂 And how the heck did you manage to score such awesome yarn at goodwill? I’ve seen some wool, but none of it has been good. It’s always an eyesore, and I don’t wonder why it’s at goodwill. I’ll have to keep my eye out at my local goodwill. Like I said, I’ve seen real wool, but I don’t hold my hopes up for such a great find as Rowan. And fair enough, what we will knit for those we love. You have looks of terrific planning going on here. I can wait to see the crabby hat. It’s sounds fun. Lovely yarn. I especially love the neon one.